The region was occupied in the 17th century when a mission stood just SE of present-day Fabens. A stagecoach stop existed just NE of the town in the 1870s but it wasn’t until 1900 when a man named Eugenio Pérez opened a store here. With the arrival of the Galveston, Harrisburg and San Antonio Railroad, Fabens’ status increased and Pérez’ store was granted a post office in 1906. The name came from a railroad official named George Fabens. By 1914 the population was estimated to be 100 but the Mexican Revolution swamped the town ten fold with refugees fleeing the conflict on the other side of the river. Fabens was platted in 1911 and in 1916 the opening of the Franklin Canal lured investors wanted to buy irrigated cotton fields. From a population of just 50 in the mid 1920s (the Mexican refugees had returned to Mexico by this time) it rose to around 2,000 by the end of that decade. The Great Depression reduced the population, but not as severely as most Texas towns. There was an estimated 1,600 residents in the early 1930s, growing to 1,800 by the end of the decade. Each ensuing decade added population and by the 1990 census there were nearly 5,600 people. It rose again by 200 to over 8,000. 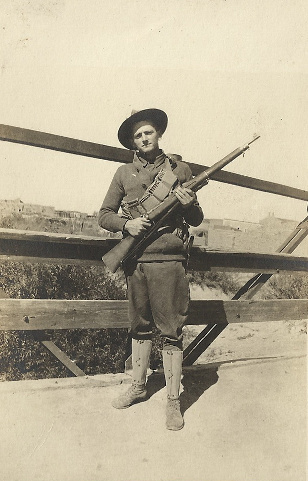 Armed soldier on bridge, circa.1912? "Here is a picture I had taken while guarding the International Bridge at Fabens, Texas. We only carried one Bandiller of ahells in the day time and two at night, besides our cartridge belt. You can see the Mexican town at my back across the Rio Grande River. This bridge made me think of the Gilpen Bridge but I have never got home sick yet." "In April 1972, Fabens served as a location for the filming of the Sam Peckinpah film “The Getaway”. The crime drama, starring Steve McQueen and Ali MacGraw was replete with explosions, car chases and intense shootouts. The film would become Peckinpah's and McQueen's biggest financial success to date, earning more than $25 million at the box office. Fabens is located along Interstate Highway 10. Most visitors only stop for short periods of time to eat at one of the several restaurants or stay overnight in the hotel.